There’s something really heart-warming about receiving handmade Valentine cards. It just makes you feel a little bit extra special knowing that someone has taken the time to make something just for you. That’s why I go out of my way to hand make cards for the people in my life that mean so much to me. I want them to know how special they are. But it can be a challenge to create something that I feel is good enough. I know my recipients are going to keep my card indefinitely (probably forever) so it needs to be sensational! I don’t want to give them something I’m not proud of. There are lots of beautiful handmade Valentine cards online, but I don’t like to copy anything exactly. Apart from the fact that some designs are just too difficult to figure out and that I probably don’t have the supplies they used anyway, I like the idea of personalising my cards so they are completely unique creations. So I look for ideas that can be easily adapted to suit me. It’s stylish. It’s very easy to make. And, it can really be adapted to suit any theme. Change the colours to pink, yellow and white, replace the message with “It’s A Girl” and you have a sweet Baby Girl card. Or, you can adapt the design to create your own handmade Valentine cards! For example, instead of a green card as the background, you may instead use black. You could then replace the striped paper with a red patterned paper and the dots paper with a pink patterned paper. Finally, you could stamp the message “I Love You” or “Happy Valentines Day” on a piece of white cardstock and place it in the centre of your card. And voila! This birthday card has suddenly become your own unique handmade Valentine card! In order to adapt one card design to a fresh new design, you have to break it down into its components. That way you can figure out what supplies you will need and how to put them together to create your card. This is the idea behind card making sketches. Sketches show you the different elements that make up a card and how to assemble them to create your final design. The sketch shows the base card, the background rectangle, the heart shape and the sentiment all laid out for you so you can see how to design your card. It’s just up to you to select your theme and colours. What could be easier! You can find more card making sketches (as well as full instructions on how to create your handmade cards) in 50 Card Making Sketches. It’s the ultimate card making sketches resource featuring 50 unique card sketches and lots of examples of how to adapt them to suit your card making projects. It makes creating beautiful cards you can be proud of so easy and so much fun. Finding inspiration to create your own Valentine card ideas can sometimes be a little bit of a challenge. I know! I’ve spent hours and hours surfing the net, scouring online card galleries and websites trying to find that perfect valentines card idea…and then when I finally find something I like, I pull my hair out trying to figure out how to recreate it without any instructions and with completely different papers and embellishments. It’s not an easy task! I love making my own cards, but it can be a little frustrating at times. I’m not Picasso or Rembrandt. Trying to be creative at the drop of a hat is difficult. But, I have found the solution! It features invaluable insight into how to stay inspired so you can create (and be proud of!) all the cards you want, no matter what the occasion or theme. Plus, there are plenty of examples to help get you started. It’s perfect for creating your own Valentine card ideas. I made this cute card based on an example in the free report. 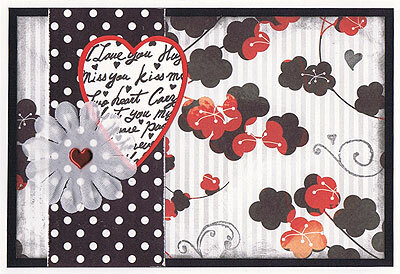 To create this card, I used white cardstock, black cardstock, red cardstock, Kaisercraft Sakura Park Kanzan paper, Black Polka Dot paper (brand unknown), black ink, a black pen, Heart Words stamp (brand unknown), Basic Grey Swirl stamps, white Bazzill flower and a red heart brad. I followed the step-by-step instructions in the ‘Inspired Card Making Report,’ substituted the card making supplies I wanted to use and tweaked the design as I wanted. For example, there were a few ‘white spaces’ on my background paper that I wasn’t really too pleased about, so I filled them by stamping some swirls and heart images. They look like they are part of the patterned paper, but they give my card a more Valentines Day sort of feel. I also inked around the edges of my background paper to give it a warmer, more sophisticated feel. The instructions in the report made it really easy to personalise my Valentines Day card so it really is my own creation. Plus it was quick to put together and a lot of fun. I’ll definitely be making more cards this way! If you are looking for Valentine card ideas, I highly recommend you download your free copy of ‘Inspired Card Making’ today. 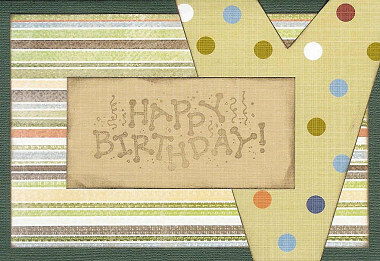 Click Here To Get Inspired Card Making Now. Learn about the materials for an embossed Valentine’s Day card with expert tips on Valentine’s Day crafts in this free video. Bio: Janet Casto owns Stampin’ Up! She offers classes, home parties and sells stamping and scrapbooking supplies. Learn how to use marker for an embossed Valentine’s Day card with expert tips on Valentine’s Day crafts in this free video. Who needs Hallmark? Here are the supplies you’ll need to make your own Valentine’s day cards with this free video clip. Bio: Matt Cail is a painter, makeup artist, and cartoonist. While in college, he acted in, directed and designed the University of Washington’s haunted house. How to make heart and hand shaped Valentine’s Day cards with your children; get expert tips and advice on making holiday themed arts and crafts projects for kids in this free instructional video. Bio: Stacey holds a bachelors of science in education and human sciences, with an endorsement in inclusive early childhood education, specializing in birth to third grade education. Learn how to make homemade Valentine’s gifts from a professional art teacher in this free video about making a paper rose for Valentine’s Day. Bio: Lanie Evans is a certified art instructor with the AISD, and she has been instilling the creative spirit in children for over six years. Learn how to make a handmade Valentine’s Day card and more in this free arts and crafts video taught by an expert. Bio: Elouise Hester is a paraprofessional and homemaker. She uses her creative talents to make personalized stationary and cards for her friends and family. Learn how to make a knot for an embossed Valentine’s Day card with expert tips on Valentine’s Day crafts in this free video. Make a Valentine Card using the “Heated Pearls” technique and Pearl Ex.